A police car burns after normalista students attack police station in Tixtla, March 28, 2015. Normalistas from the Ayotzinapa normal school were violently confronted by riot police Saturday afternoon in a village near the city of Chilpancingo. Earlier reports indicated there were various injuries and three young detainees, all of whom we are told have since been released. After the confrontation, several riots took place in Tixtla where apparently four or five members of the Municipal Police were detained by comunitarios (community police). Riot police smash out the windows of a bus carrying normalista students, March 28, 2015. The confrontation occurred around noon on Saturday between about 50 normalistas from Ayotzinapa and 200 state police in riot gear, at the junction of Tierras Prietas on the Autopista del Sol. A young man was beaten by the police and was arrested along with two other normalistas. 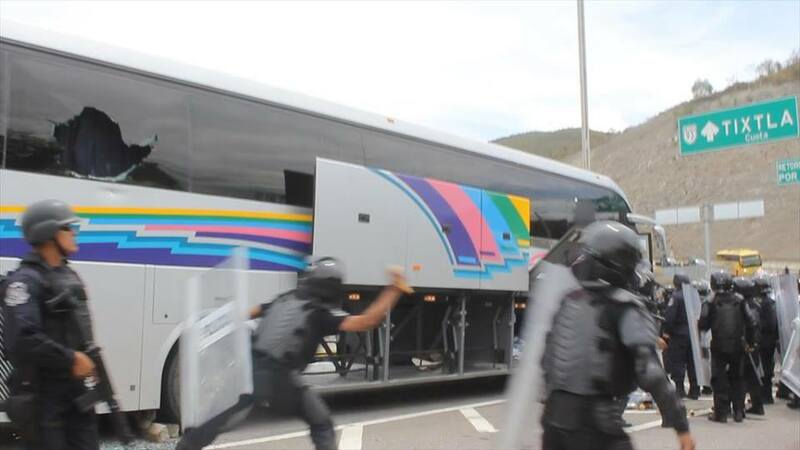 The incident occurred after state police intercepted a bus on the Autopista del Sol carrying normalistas, who had expropriated a tanker truck carrying gasoline. Reportedly, around 11 am normalistas left to go to Zumpango on a bus belonging to the Futura company and an expropriated tanker truck containing 53,000 liters of gasoline, which was being transferred to Chilpancingo. However, about 12:16 pm on Saturday, a group of about 200 riot cops intercepted the students in Tierras Prietas, on their way to Tixtla. Reports indicate that the police violently disembarked the students from the bus, broke the bus windows and beat the students repeatedly as normalistas ran to escape, but one of them was arrested, beaten and kicked by five policemen. The police prevented reporters who arrived at the scene from taking pictures. The young normalista who was beaten and two other normalistas were arrested. About 50 policemen guarded the bus and tanker at the junction located at the entrance to the capital. Meanwhile, a group of parents from the Ayotzinapa normal school, students and attorney Vidulfo Rosales Sierra, who participated in the Second Solidarity Gathering for Ayotzinapa, left the normal school at 1:45 on a bus to Chilpancingo to verify the status of the detained students. Reports from local activists indicate that those arrested have since been released. 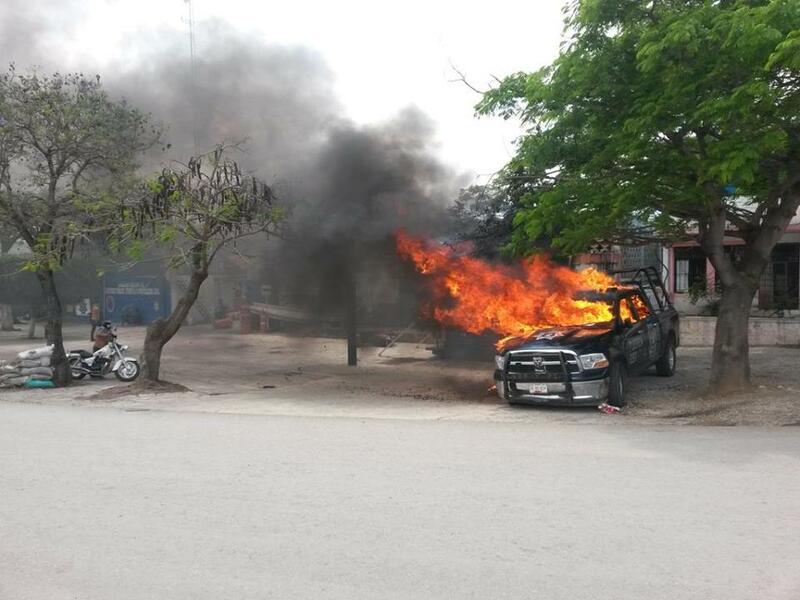 Students from Ayotzinapa burst into the headquarters of the Municipal Police Tixtla around 1:00 pm, where they burned a police patrol car and an ambulance and four or five policemen were detained by comunitarios. After the incident, the students left the city and returned to the normal school, while guarded by elements of comunitarios (community police). Posted on March 29, 2015, in Uncategorized and tagged Ayotzinapa, Mexico, normalistas. Bookmark the permalink. 1 Comment.